The Phaser 8550 printer is so fast you can expect up to 30 ppm in full color! 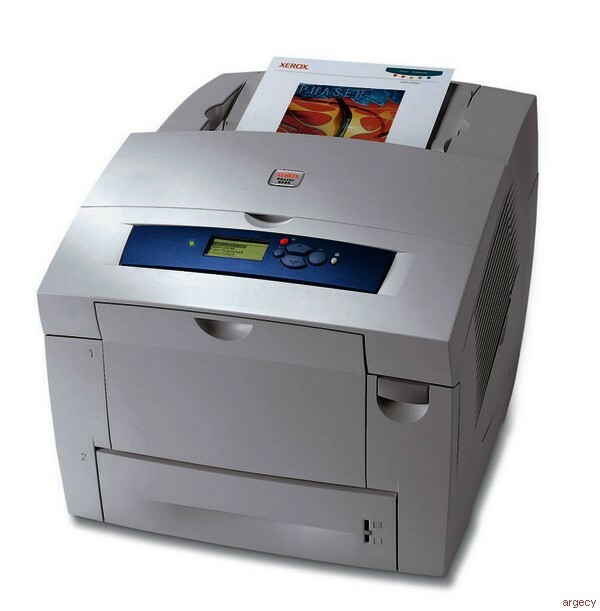 Or choose the Phaser 8500 printer for up to 24 ppm in color. - - Industry leading speed. As fast as 5 seconds until your first page out on the Phaser 8550, and as fast as 6 seconds on the Phaser 8500. - - True Adobe Postscript 3 - , automated troubleshooting and job accounting. Plus, on the Phaser 8550 you get advanced paper handling features such as automatic two-sided printing, collation and booklet printing. - - Built with large paper trays so you can get the big jobs done without interruption. - - A robust duty cycle delivers the reliability you need in a busy workgroup. Stand out from the corporate crowd with color that makes an impact. - - Solid ink provides superior print quality on a wide range of media types and weights - from recycled to cover stocks to transparencies and more. - - Expect color that's truer, more saturated and remarkably consistent - from your morning coffee through to the late night crunch. - - 2400 FinePoint - image enhancement technology on the Phaser 8550 provides the ultimate in print quality. - - Compact, no-mess ink sticks are as easy to load as a stapler. You can drop them into their slots at any time. - - Run out of color ink? No problem. You can continue to print in black-only mode if you prefer. - - You can keep a personal mailbox on the printer's hard drive (optional on Phaser 8550 only). So if you're late for a meeting and need an extra copy of something you've printed - just walk up to the printer, select the stored job and hit 'print'. - - These printers keep track of your printing habits. The Intelligent Ready feature learns when you print most and warms up or enters power-saving mode accordingly. - - Installation made easy. It's out of the box and on your network in just four steps. - - Off-site Xerox keeps you in the loop. A built-in web server allows you to manage, configure and troubleshoot printers from anywhere using a web browser. - - Enjoy quick desktop access to printer and job status, email alerts, simplified printer installation and network administration. - - Keep tabs on office activity. The Usage Analysis Tool enables you to collect, organize and analyze job accounting data. PrintingScout PrintingScout instantly displays pop-up help if attention is needed during print jobs. Phaser installer Phaser Installer automatically gets you printing in seconds. PhaserSMART PhaserSMART remote diagnostic tool provides automated Internet-based support. Environment Temperature: Non-operating: -30 to 60 C (-22 to 140 F); Operating: 10 to 32 C (50 to 90 F). Relative Humidity: Non-operating: 10 - 95%; Operating: 10% - 80%. As an ENERGY STAR Partner, Xerox has determined that this product meets ENERGY STAR guidelines for energy efficiency.